Pigs and Monkeys and Mossad, Oh My! And, as he usually does, David lets the Koran hoist itself with its own petard. The shouting imam in New Zealand, blaming Mossad and Zionists for this latest mass killer, is the usual predictable Koranic Kutie. I’ll bet most of us can sing along with him by now. Meanwhile, The Apostate Prophet tells us what it’s like to grow up in Germany learning his ABCs of hatred against the kuffar. Just so you know its origins. Are we recycling the 1930s all over again? A place where anti-Semitism is cool, and the anti-Semites are free again to shout the same filth all over again? But only certain haters are given a free pass on foaming at the mouth. Others are so muzzled by political correctness that they live in hiding or under guard — Salman Rushdie and Geert Wilders come to mind. What is so mind-boggling about that New Zealand imam’s rant is not his “anti-Zionist” tirade, but that New Zealand is so accepting of it. There don’t seem to be (m)any MSM reports on this phenomenon. I’ve been hanging around all day, looking for items. They’re few and far between. The nutjob who massacred those Muslims in New Zealand is being compared to Breivik. As I said at the time of ABB’s massacres, first in Oslo and later on Utøya island, people in a position of power who sincerely wanted to know the deeper reality behind his Manifesto needed to have a forensic analysis done on his work. Of course, they didn’t want the truth; they wanted the circus they created, so the real authors got away with murder. More murder than they’d planned on perpetrating, perhaps. Their monster had a mind of his own; he got away and then went off-script. They didn’t know ABB didn’t care if he got caught. ABB had plans for his incarceration. Besides, I think they sold him a bill of goods about being the leader of a neo-Nazi movement which would rise up and free him from that court. Later on, in prison, after Breivik sent out a formal retraction of “his” ideas to the major news media, admitting he’d been a neo-Nazi the whole time, the MSM ignored this plot twist. They liked him stuck in the hardened concrete they’d poured into his place in history so there he would stay, anti-Islamic to the end. This new nutjob, at the other end of the earth, is even now having the cement poured around him before it’s been determined if he’s sane. Or if he had help with composing his “manifesto”. Nope, they’re setting him in stone, and will carve the narrative to fit their own nefarious needs, Truth be damned. You can bet the annual OIC report on “Islamophobic attacks” will feature this one big time. Usually, all they have to write about is endless accounts of bacon left on the threshold of a mosque or some (easily removed) graffiti. Now they have a story with teeth, and we will hear them growling over it far longer than we heard about 9/11 or 7/7. Don’t you wonder what PR term will come to designate this NZ massacre? A mass killer is, ipso facto, crazy. It doesn’t matter if he’s legally ‘sane’, he’s still a whackjob. But then, so are those who claim his weapons belong to Mossad also insane. They are not only whackjobs, they’re selling their souls for anti-Semitic ABCs they took in with their mother’s milk. Oh, I just remembered Trevor Loudon’s website, New Zeal. Find it here. For whatever glitchy reason, my browser doesn’t want to open it. I can say if you scroll down a bit, he’ll have more accurate information than you’re likely to get elsewhere. Please report back — don’t know when I’ll be able to open it. The essay below by Matthew Bracken serves as a follow-up or companion piece to “The Alienork Way”. Hundreds of years ago the Moriori, of the Chatham Islands, took a solemn vow of peace known as Nunuku’s Law. The decision to uphold this sacred law in the face of aggression in 1835 had tragic consequences. They were slaughtered, enslaved, and dispossessed of their lands. 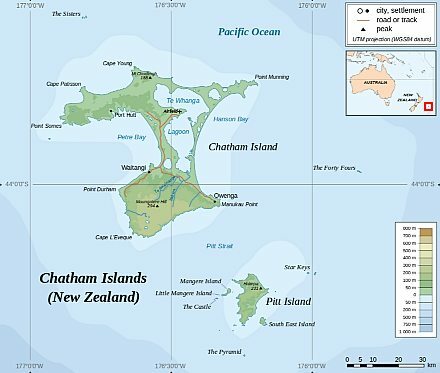 The Moriori lived on Chatham Island and Pitt Island, two islands in the Chatham Islands group, about 700 kilometers south-east of Wellington. 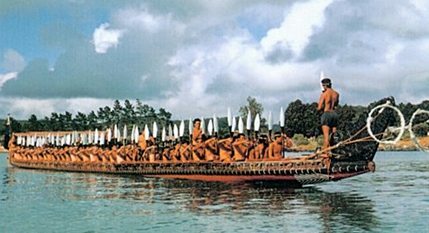 Nunuku’s Law: Isolated from mainland New Zealand, the Moriori developed a unique culture based on a law of peace. This was called Nunuku’s Law, after the ancestor Nunuku-whenua. After seeing bloody conflict between the Hamata people and later arrivals, he banned murder and the eating of human flesh forever. 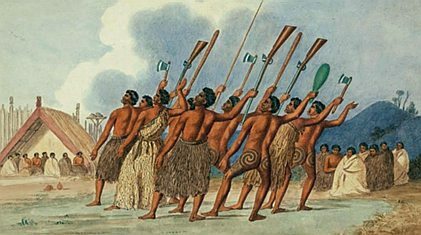 After 1791, when the British ship Chatham called at Rēkohu, Moriori came into contact with Europeans and Māori who came as crew on sealing and whaling vessels. Some settled on the islands and lived alongside the Moriori. This relative peace was shattered in 1835 when Maoris from two tribes, both from Taranaki, arrived in the Chatham Islands in search of new territories and resources. In 1835, 24 generations after the Moriori chief Nunuku had forbidden war, the Moriori welcomed about 900 people from the two Māori tribes. Originally from Taranaki on New Zealand’s North Island, they had voyaged from Wellington on an overcrowded European vessel, the Rodney. They arrived severely weakened, but were nursed back to health by their Moriori hosts. However, they soon revealed hostile intentions and embarked on a reign of terror. Stunned, the Moriori called a council of 1,000 men at Te Awapātiki to debate their response. The younger men were keen to repel the invaders, and argued that even though they had not fought for many centuries, they outnumbered the newcomers two-to-one and were a strong people. But the elders argued that Nunuku’s Law was a sacred covenant with their gods and could not be broken. The consequences for Moriori were devastating. 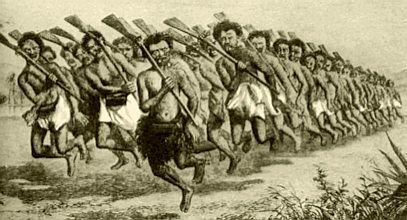 Although the total number of Moriori first slaughtered was said to be around 300, hundreds more were enslaved and later died. Some were killed by their captors. Others, horrified by the desecration of their beliefs, died of ‘kongenge’ or despair [often suicide by leaping from cliffs]. 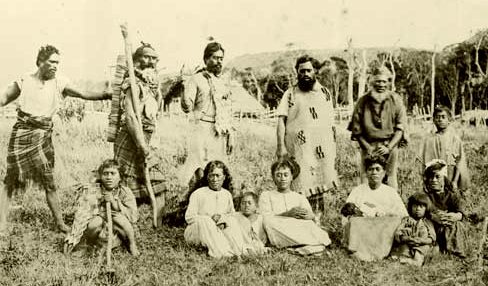 According to records made by their elders, 1,561 Moriori died between 1835 and 1863, when they were released from slavery. Many succumbed to diseases introduced by Europeans, but large numbers died at the hands of the Maoris. In 1862 only 101 remained. When the last known full-blooded Moriori died in 1933, many thought this marked the extinction of a race. We took possession, in accordance with our customs and we caught all the people. Not one escaped. Some ran away from us. These we killed, and others we killed – but what of that? It was in accordance with our custom. The lesson of Chatham Island is that people who live in comfortable circumstances for enough generations to forget the horrors of anarchy and total war, will often let down their guard to a fatal degree. The examples I will compare are Chatham Island in 1835, the Island of Plenty from my Alienork Way allegory, and Europe today. It is my observation that, in a well-calculated series of defined steps and expected responses, alien Orks (taken from “The Alienork Way”) can overcome and subdue even an outwardly more affluent, powerful and successful society. Who Decided the Location of the Second Front? I wasn’t aware that Andy Bostom had written this article when I posted about American Betrayal early this morning. Dr. Bostom originally submitted his piece to American Thinker, and, like Diana West, was rebuffed — further evidence of the long arm of The Invisible Man. Déjà vu all over again, Diana West has noted at her website how she was not permitted to respond to a new round of critiques of American Betrayal at The American Thinker, which astonishingly included letter “appendices” containing two more rounds of ad hominem attacks on her by Ron Radosh and David Horowitz. My own response to American Thinker’s “military expert” editor J.R. Dunn provides an introduction to a staid essay that was also summarily rejected without any ethical, or factual justification. The unsuccessful British Dodecanese efforts codenamed “Accolade” — which were apparently not very large troop deployments — at any rate took place between September 8 and November 22, 1943. Italy was the correct place in which to deploy our main forces and the objective should be the valley of the Po. In no other area could we so well threaten the whole German structure including France, the Balkans and the Reich itself. Here also our air would be closer to vital objectives in Germany…. You obviously compound your intellectual laziness — i.e. you NEVER bothered to read the relevant FRUS Diplomatic Papers, with a fundamental reading comprehension deficiency. This explains your non-sequiturs and generally confused, profoundly ignorant (albeit confidently asserted) “observations.” Seen in this light, although these errors are now understandable, they remain unacceptable. It is well past time for thoroughly incompetent, self-appointed “gatekeepers” like yourself to in fact be given the gate to the great benefit of intelligent readers, fully capable of separating wheat from chaff without your “remedial” censorship. Installment two of Jeff Lipkes’ discussion of Diana West’s American Betrayal is entitled, “Diana and Ron: The Second Front.” Readers can decide for themselves whether or not Lipkes adequately represents Ms. West’s arguments by comparing his assessment to her own full chapter on the so-called “Second Front debate.” Regardless, I maintain readers wishing to understand this serious World War II (WWII) debate — and the post- WWII consensus about the geo-political consequences of its “resolution” — would do well to consider the historian Hanson Baldwin’s post-mortem assessment monograph, published shortly after WWII concluded. Hanson W. Baldwin (d. 1991), was a military-affairs editor for The New York Times who authored over a dozen books on military and naval history and policy. Baldwin, a graduate of the United States Naval Academy, joined The Times in 1929, and in 1943 won a Pulitzer Prize for his World War II reporting from the Pacific. Before retiring from The Times, Baldwin reported on the strategy, tactics and weapons of war in Korea, Vietnam, the Middle East and other theaters. Earlier, after covering the European and Pacific battles of World War II, as well as the immediate postwar transition period, so astutely, Hanson Baldwin had already earned recognition as one of the nation’s leading authorities on military and naval affairs. 1. That the Politburo had abandoned (with the ostensible end of the Communist International) its policy of a world Communist revolution and was honestly interested in the maintenance of friendly relations with capitalist governments. 2. 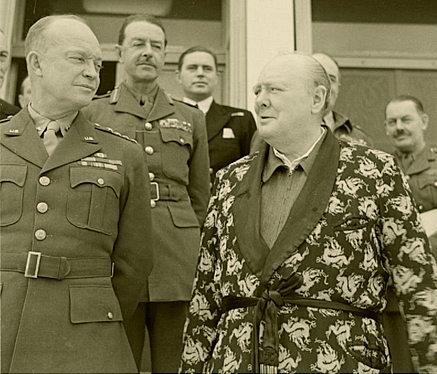 That “Joe” Stalin was a “good fellow” and we could “get along with him.” This was primarily a Rooseveltian policy and was based in part on the judgments formed by Roosevelt as a result of his direct and indirect contacts with Stalin during the war. 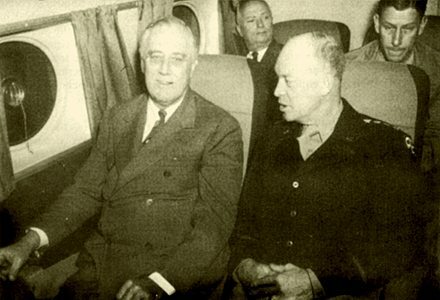 This belief was shaken in the last months of Roosevelt’s life, partly by the Soviet stand on Poland. 3. That Russia might make a separate peace with Germany. Fear of this dominated the waking thoughts of our politico-strategists throughout all the early phases of the war, and some anticipated such an eventuality even after our landing in Normandy. 4. That Russian entry into the war against Japan was either: a) essential to victory, or b) necessary to save thousands of American lives. Some of our military men clung to this concept even after the capture of the Marianas and Okinawa. …lack of adequate knowledge about Russian strengths, purposes, and motivations; and inadequate evaluation and interpretation of the knowledge we did possess, or failure to accept and apply it. “Islamophobic” demonstrators are out in force again in Tahiti, this time to protest the arrival of an imam who is unknown to the official Islamic authorities in France, and has also been banned from the USA as a terrorist. We all share the same concern regarding the presence of the self-proclaimed Imam Hicham El Berkani on our territory. His personality, his lack of transparency (his origins, funding), his defiance of our laws, his insistence on returning here while he is banned in the USA, lead us to have serious doubts about him. Why is this imam allowed to circulate freely on our territory, while he is considered potentially dangerous by the American Secret Services? Why is he allowed to officiate freely, while he is manifestly an outlaw (illegal)? We ask for the definitive expulsion of this suspicious “Imam”. Lets march together to preserve our identity, our culture, our future and that of our children. NO TO THE IMAM, NO TO ISLAMISM, NO TO EXTREMISM. The march took place Saturday 12 July 2014 at 1 pm. 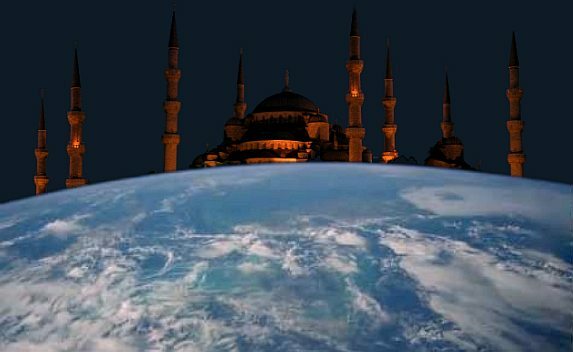 This is the latest in a series of monthly reports by our British correspondent JP on the progress of worldwide Islamization, as represented by the building of mosques, and activities associated with mosques. Of note during June 2014 in a crowded field were reports of a new traffic light system at Abu Dhabi’s Sheikh Zayed Grand Mosque costing over US $2 million and the renaming of three mosques in Gambia after deliberations by the Committee of Banjul Muslim Elders. Not to mention the hullabaloo in Bendigo after its council approved a controversial mosque proposal. Ramadan report featured Islamic Society of Brevard mosque in south Melbourne. Its spokesman said that even though the mosque had been expanded three times, congregants occasionally had to pray in the parking lot. Report on the $1.9 million renovation of the Islamic Center of Greater Miami serving the community of South Florida Muslims estimated at about a hundred and fifty thousand. The renovations include a plush $25,000 gold and maroon carpet, cushions, and copper-toned dome. Islamic Society of Pocatello excited about construction of its mosque due for completion at the end of June. “It’s going to be a very open space,” said general secretary of the Islamic Society, Daniel Hummel. According to another report, the Islamic Society of Southeastern Idaho took on a big project when it decided to convert an old fast food outlet into a sacred space. A Midland Park resident appealed to the borough against the decision of its Zoning Board to approve an application by an Islamic foundation to convert a Korean church on Irving Street into a mosque. “I find the application incomplete, at a minimum, and defective,” Joan Doumas said in her letter of appeal. Two Korans found burnt near a mosque in Dearborn. Previously, Pastor Terry Jones and a group of motorcyclists had announced a rally against the threat of Islamic law being implemented in the U.S. This was due to take place on Flag Day, 14 June 2014, in front of the Islamic Center of America in Dearborn. Jose Sanchez, owner of a boxing gym in an East Harlem tenement, embroiled in a row with his landlord after the latter leased the premises to a West African spiritual leader for his displaced Masjid Aqsa Mosque. Sanchez plans to take his case to the Manhattan Housing Court. Terror investigation led to major drug bust at the Islamic Center of Flatbush. US Supreme Court refused to hear the appeal of a group of neighbors who tried unsuccessfully to block construction of the Islamic Center of Murfreesboro. See here and here for the role played by the Becket Fund for Religious Liberty in defense of the mosque. The case against a burial site at the same mosque was also dismissed. Two Mississaugan Muslims lodged a complaint with Ontario Human Rights Tribunal after being issued with parking tickets while attending mosque prayers. They believe the early Friday afternoon parking restriction discriminates against Muslims. This is the tale of Avondale Islamic Centre. It’s like the Mosque on the Prairie, except it’s in New Zealand, and it’s a real mosque so everyone is trying to kill each other. See the New Zealand section for details of the holy war launched by a firebrand Salafist imam and his followers on other Muslims, private security guards, and New Zealand Herald reporters covering the story. Note also Paul Wilkinson’s report on phases of Islamisation in three English towns: Whitley Bay, Dudley, and Bradford. Finally, some commentators at recent online discussions about the British Islamic schools Trojan Horse plot provided links to the Channel 4 documentary Undercover Mosque, first aired on 15 January 2007 — a link is repeated here in the end notes. One of the founding members of the Clinton Islamic Center, Dr. Anis Ansari, elected president for the fourth time in the past twelve years. Bridgewater residents jeered and disputed traffic expert testimony that suggested the proposed Al Falah Center mosque development would not have a negative impact on local traffic. The next planning board meeting at the Bridgewater-Raritan High School is scheduled for 30 June. Report on plans by the Islamic Society of Central New York to build a $1 million mosque-community center on land it owns on East Seneca Turnpike in the town of Onondaga. “Our numbers are growing — we need more space,” said society President Mohamed Khater. A federal appeals court ruled that a Christian police captain from Tulsa was rightfully punished for refusing to enter a mosque for a police appreciation ceremony. The Islamic Center of Columbia, also known as Masjid al-Muslimiin, held a ‘Share Islam Day’ for those interested in the area’s diverse spirituality. Senior Judge Paul Summers of Davidson County appointed to hear a case over a county-approved cemetery at the Islamic Center of Murfreesboro after all other judges in Rutherford County recused themselves from the matter. Redmond residents concerned over plans for the proposed two-storey, 22,467 square feet Anjuman-e-Burhani Mosque on empty land near Microsoft Corporation’s headquarters. Hamilton Downtown Mosque held a fun fair at its new premises to raise funds for further refurbishment. 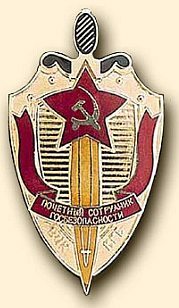 Several years ago I wrote about the Soviet counterintelligence state, whose principal intelligence organ underwent numerous mutations from 1917 to 1991, becoming successively the Cheka, the OGPU, the MGB, the NKVD, and various other acronyms before it settled into its final form as the KGB in the 1950s. The state intelligence apparatus did not dissolve after the Soviet Union collapsed, but was reorganized as the FSB, and still serves as the security service for the Russian Republic. As Ion Pacepa notes in his superb book Disinformation , #7 dezinformatsiya was considered by the Soviets to be the most effective tool of subversion against the capitalist world. The dissemination of disinformation absorbed more resources and manpower than traditional espionage (that is, the collection and analysis of the enemy’s secrets). The acquisition of the H-bomb was a crucial necessity, but so was causing disgust, doubt, and despair in the hearts of ordinary Westerners. Interestingly enough, a wave of disinformation recently surfaced here in the comment threads at Gates of Vienna. I didn’t pay much attention to it at first; it took me a while to catch on to what the new commenters were up to. They obeyed our rules and didn’t engage in ad hominem attacks — their comments were just hostile, and I’m used to that. The new trolls asserted various negative things about Christians, white people, Europeans, etc. They left information contradicting the post or other commenters in ways that made Muslims look good or non-Muslims look bad, but without providing any links. What made me start paying attention was the issue of the teenage girl in New Zealand who was forced to wear a burka to cover up her injuries after her father beat her up. Several commenters — who may have been sock puppets for a single operative — appeared on the news feed thread and stated that the information in this news story was incorrect, that the family were Maoris and not Muslims. They reported that major media outlets in New Zealand had in fact run corrections. They even named specific media outlets, but supplied no links. By this time I had realized we were being trolled, and deleted all the new instances of such comments. While I was at it, I took the trouble to look more deeply into the New Zealand story. After extensive searching through media reports, I concluded that no such corrections existed. There weren’t any stories that contradicted the initial reports from The New Zealand Herald. This confirmed that we were the target of a deliberate, sophisticated disinformation campaign. Coming next: The McMurdo Sound Mega-Mosque.